Applying to college is a long and challenging process. From the first SAT through the final acceptance notification, parents and students are overwhelmed with information, conversation, competition, opinions and so many more things that make getting into college – the right college – seem like the most labor-intensive and overwhelming task. While our high schoolers are studying, taking practice tests, playing their sport of choice at their absolute best and trying not to let the college process interfere with the experience of being a junior – then senior – in high school, parents are trying to navigate the road to college without any major collisions – with their child, with their spouse, with their own hopes and ideas for what their child should choose and do during the college years. There isn't a parent going through the college labyrinth who would not benefit from the book Grown and Flown - from 11th Grade Stress to College Success. 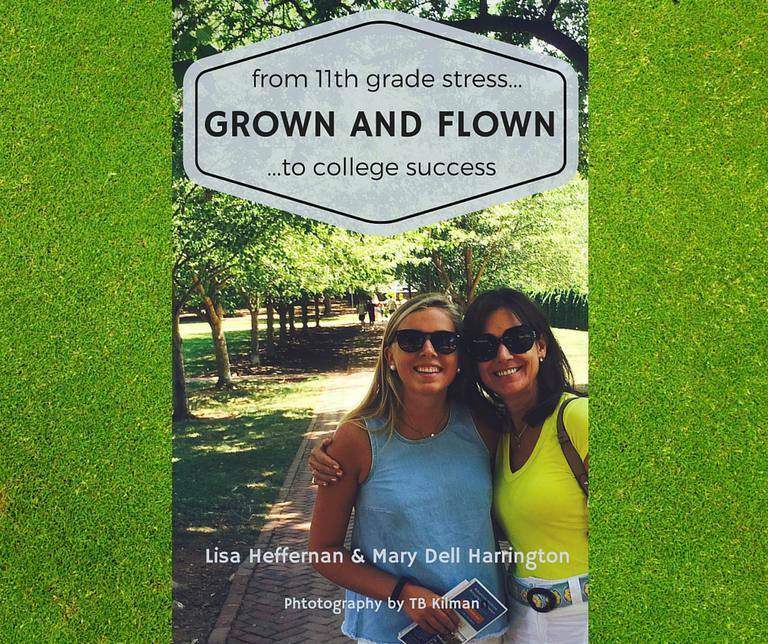 Written by Lisa Heffernan and Mary Dell Harrington, the creators of the wildly popular blog and website Grown and Flown, with photographs by Teresa Kilman, this book offers a bit of everything a parent needs to make it from junior year to dorm move-in day. How to and informational topics covered in this well-written and gentle book include determining if your child is ready for college, helping your child through the sometimes painful experience of junior year, advice for college freshmen from a college professor and tips on how to finish college in 4 years. "8. Read the fine print Parents need to be involved in the application process. This is a complicated process with multiple essays, recommendations, supplements and more. One of my kids almost missed an application deadline because the art supplement needed to be submitted in October. Another son almost did not get a recommendation from an employer because he missed a small asterisk describing the circumstance under which additional letters were allowed. They were studying for exams, doing sports and activities… I read the fine print." "3. Engage Come to class prepared enough to ask a perceptive question or make a useful comment. Don’t be a wallflower, but don’t dominate either – your fellow students will not love you if your hand is always the first one up. When you email a professor, do it for a good reason and be respectful (don’t address us as “dude” or by our first names unless we’ve asked you to). Turn off your cell phone and do not text during class. We can tell." Not all of the essays are how-to and informational in this book. There are many that are about the emotional experience of watching our children grow up and leave home, leaving parents behind as they begin new lives. For those having a difficult time coming to terms with the change in their family dynamic or the idea of saying goodbye to their children as the fly from the nest, there are essays about saying goodbye to being a sports mom, letting your children go, and writing the letter to end all letters to your child. "And then they left home. They woke up one morning like they have thousands of other mornings and by nightfall they were gone. At first I told myself that it was like camp (my capacity for self-delusion appears to know no bounds) but after a few months I had to let go of this little lie and contend with the fact that college is leaving home." There is so much to explore in this book for parents who are looking for encouragement and reassurance that everything about sending their children off to college is going to be alright. From practical matters like shopping for the dorm to more personal issues like saying goodbye, Grown and Flown- From 11th Grade Stress to College Success has so much to teach any parent of college-bound children.